The cost-effective smart feature phone does not compromise in terms of feature or specifications, and has long-lasting battery life, rear camera, Bluetooth, wireless FM, and smartphone-like app store! 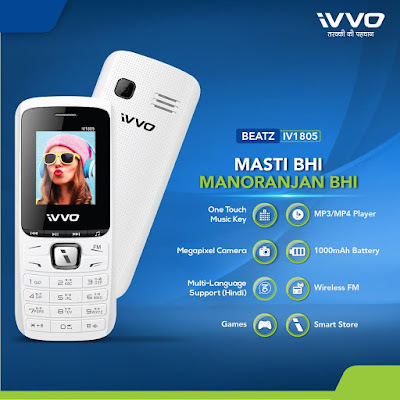 On a mission to eliminate the prevailing digital disparity between rural and urban India, iVVO, a pioneering communications brand and the latest entrant in the Indian mobile phone market, has launched its dual-SIM smart feature phone Beatz IV1805 for Rs. 600. iVVO is a subsidiary of BRITZO, a brand that recently claimed its fame by spearheading multiple state-of-the-art innovations across ICT (Information and Communications Technologies) that are primarily aimed at the rural Indian audience. The latest offering from iVVO has been launched under the product category ‘Beatz’, which features a wide range of smart offerings developed for music-friendly rural customers. The cost effective smart feature phone boasts of App Store ‘iVVO Smart Store’ enabling the consumer to download & enjoy a wide range of apps, games, music and videos. The cost-effective smart feature phone even does not compromise in terms of other features and comes loaded with 1.8” display, 1,000 mAh battery, MP3 and MP4 players, wireless FM, rear camera, GPRS and Bluetooth connectivity, one-touch music access, and a memory expandable up to 32 GB. Moreover, the smart mobile phone has integrated regional language support to further catalyze digital adoption amongst Indian rural geographies – all at a maximum retail price of Rs. 600! iVVO is extending a product warranty of 455 days on the newly-launched Beatz IV1805. iVVO has a strong nationwide after-sales service presence with its broad pan-India network of about 900 service centres. Besides IV1805, the Beatz portfolio already hosts IV2401, another Smart feature phone with non conventional features. The broader objective of iVVO and its parent organization BRITZO is to bring a complete reversal of the present market order. In other words, the company is developing disruptive technologies for rural consumers across India and will make it trickle down to the urban market, rather than doing it the other way round. With its recently-launched cost-effective offering, it appears that this reversal of order is precisely where the brand is headed towards.